We again enter Ella’s world through her diary entries. 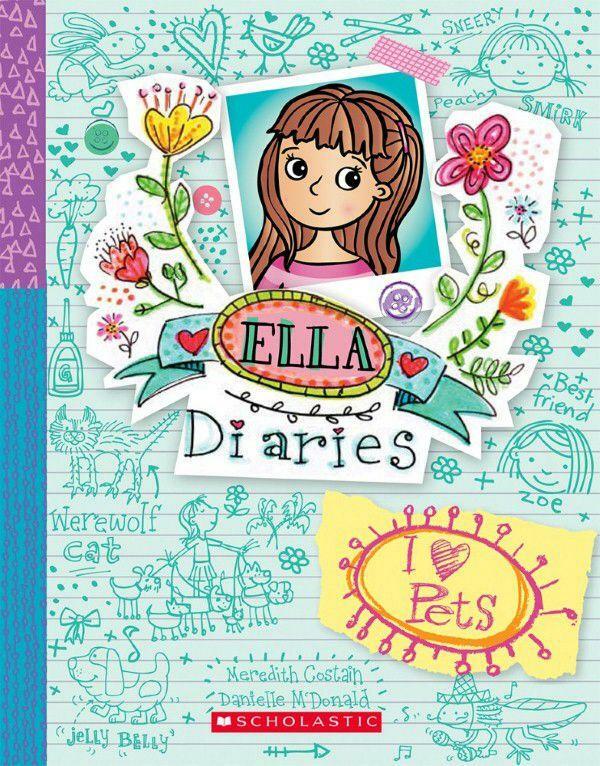 She shares everything with her diary, perhaps even more than she shares with her BFF Zoe. I Heart Pets addresses the petty jealousies and other emotions that are common in children, in a light-hearted and entertaining way. As always, it ends with a strong positive message. The fantastic layout of each page with its decorative illustrations which replicate the emotions being experienced, are such fun. I can see girls giggling behind their hands as they read these books. I love this series. It’s clever, artistic and very girlie. Of course, the attention seeking Precious Peach Parker, keeps hold of the labradoodle the whole time so no one else can have a turn. Ella knows that Peach Parker’s remarks about saving endangered animals, (even though she doesn’t own any pets) are designed to ingratiate herself with the visitors and teacher. It’s her way of sucking-up. The animal experts suggest to those interested in working with animals, to study as many as they can, and keep a Fact File on their habits, appearance and habitats. Peach Parker, master of the art of responding with what people want hear, is given a student star for ‘dedication and commitment.’ This makes the blood rush to Ella’s head. She intends to prove she can become an animal expert and earn a student star, by simply being herself. Mum suggests a Pet Walking service instead of another pet. This excites Ella and Zoe. The diary is filled with drawings and ideas. What will they name the business and how much will they charge? The girls create an enticing advertising poster with pictures of animals adorning the borders. But days pass and no customers call. This makes Ella suspicious. What has the Precious Peach Parker done? She’s up to her tricks again, stealing other people’s ideas and getting the credit for their brainwork. But she is the Queen of Mean and as with many sneaky and mean people, she will once again get her comeuppance, for cheats never prosper.